They hook up on the beach. Their lineage goes back more than 445 million years. Call them blue bloods — without the paparazzi. They are horseshoe crabs. They really do have blue blood. And although they’re not conventional celebrities, these critters are crucial to human health and the region’s ecosystem. That realization is propelling increased monitoring and public education efforts on many levels. It’s no easy task; they cover a lot of territory. Horseshoe crabs are found along the North Atlantic coast, from Mexico to Maine. They live in shallow ocean waters, coming ashore only to reproduce. They eat fish, algae and crustaceans, and can live about 20 years. "Crab" is a misnomer. They're more closely related to spiders or scorpions. 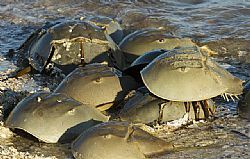 Modern horseshoe crabs are not listed as “threatened,” but it's believed their numbers have declined due to over-harvesting and loss of habitat. Little is known about their numbers today, though, in the Sunshine State. “They’re poorly understood and understudied,” said Armando Ubeda, marine biologist and Florida Sea Grant agent with UF/IFAS Extension for Sarasota County.